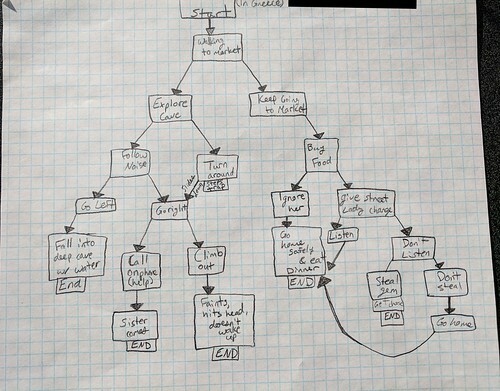 We’re in the middle of a small digital writing unit on Interactive Fiction, which is a “choose your own ending” sort of storytelling, using Google Slides and Hyperlinks as a way to publish a story. As much as I enjoy the final products — a story with choices for the reader, told in second person narrative — I truly love viewing the mapping by students of the possibilities. These maps lay bare the thinking, the possibilities of story. 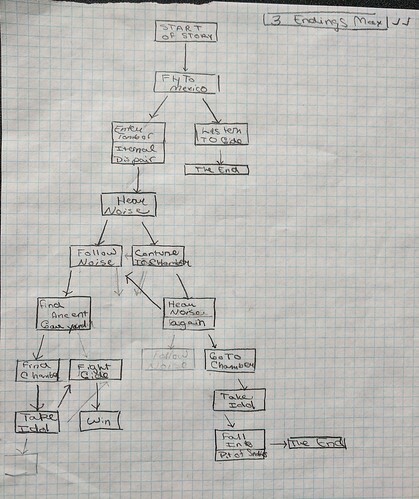 You can see an overview of the narrative arcs, the thinking behind the stories. 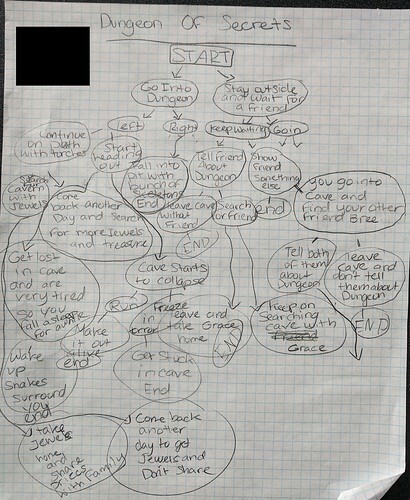 We get to this point of story mapping by first reading Interactive Stories and mapping out the journey into the story as a reader, noting where branches are and what paths we took. 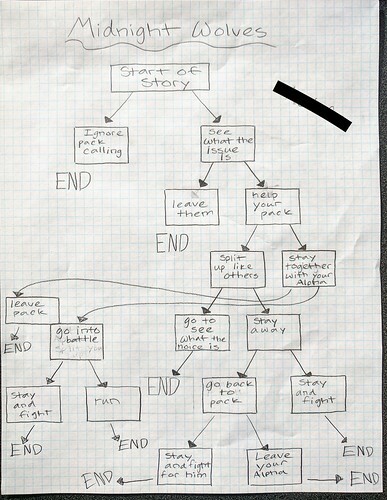 Then, they flip their role, making maps before writing the actual story for others to read. The theme of the project is a discovery of ancient ruins, and the reader is the traveler in the story, finding adventure and mystery as they move along through the story of choices. Most of my students really enjoy this writing, as it is very different from traditional pieces we do, but a few do struggle with the unconventionality of it. That’s OK, too, for what I am trying to show them is that writing is not one form, but many forms and always adaptable. Did any of your writers start with the end of the story and work backwards, reverse engineering the resolution? Just thinking out loud. Antispam-reverso-jonesing: gurus fan And all I can say is that this is how I ended up being the guru’s fan. The End. Now…reverse engineer me all the way back to the beginning. Looks like great opportunity to teach digital concept mapping tools.